Richard Russo on his new memoir, Elsewhere. 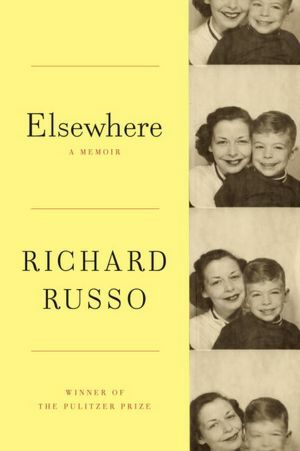 For some reason, I put in a standing order a long time ago for Richard Russo’s Elsewhere: A Memoir, and now here it sits on my coffee table, a book, it turns out, about his close but conflicted relationship with his mother. Maybe I was eager because I enjoyed Empire Falls, or maybe I was curious at the time about what an acclaimed novelist would do in his first work of nonfiction. Anyway, it was ages ago that I committed to this book, and I’ve read so many memoirs since, increasingly ones checked out from the library. I’ve realized they’re like novels—you can’t keep up, can’t read them all; I only bought Cheryl Strayed’s Wild after reading a library copy—but here on my table, for some reason, is this one, a handsome book. I think the best memoirs read like novels, which means, among other things, that the writer must decide what fits the narrative arc and what doesn’t. The fact that something actually happened doesn’t mean it should be included. A memoirist isn’t free to invent, but the shape of the story is up to him. He decides—as in a novel—how and where the story begins (near the end, in this case). He also chooses, just as a novelist does, when to summarize and when time should slow down for a dramatic scene. Speaking of conflicted feelings, I had them about Elizabeth Gilbert’s Eat, Pray, Love—like a subset of other readers, for me its veiled calculation curdled some of the book’s pleasures—but admired her writing ability. I found inspiring her recent wide-ranging interview with Rachel Khong for The Rumpus. She discusses her new historical hovel, her writerly girlhood, and her years, while learning to write fiction, of bartending and waitressing and her wasting time in “fucked-up emotional psychosexual dramas,” so that it’d take her almost a year to write one short story. A big breakthrough came with her GQ article, about a bar she worked at and where she’d set a short story, which led to the movie Coyote Ugly. It does get to me sometimes. Of course it does. Because writing is everything to me. Publishing wasn’t everything. Writing was everything. And I accidentally made this bestseller. It wasn’t my intention. And to be honest, it felt like a big risk for what I had of a career. Because prior to that point, if I was known at all, I was known as the tough-writing woman who was the only girl in the room. I quit my really good job at GQ to go traveling that year, and they couldn’t promise me that I could have that job back. I’d earned a certain amount of credibility that I knew I was endangering by speaking with such emotional candor. All the guys that I hung out with at GQ I was thinking about as I was writing Eat, Pray, Love. . . . It was a really emotionally honest attempt, and it was a really literarily honest attempt, too, as a book, and for every person who’s snarky about it, there are several thousand whose lives were altered by it, in ways that were very real, and when I meet those women and they tell me their stories and they tell me what that book did for them, or did to them, those stories are profoundly real, and they’re far more real than a gripe-y blogger. Of course the gripe-y blogger has a real life, as well. But I’ve met those women and I’ve spoken to them and I’ve seen this great opening this book gave them to start to consider questions in their own lives about what they deserve, and what they want, and what they want to seek. That’s a solace. . . .
It’s almost like Committed was the sacrificial book. I’m very fond of it and it’s very dear to me for that reason, because it went out into that aftermath and allowed itself to absorb all the disappointment and all the attacks from people who’d had years of frustration about how much they hated Eat, Pray, Love build up, and they needed to get it out on their blogs—it just took all of those slings and arrows. But then it was distracting everybody, and I got to go off and write a novel about 19th century botanical exploration! And so Committedpermitted me to write this book. I feel like that’s why you have to keep working, because you never know what your one project will open up for you, for your next one. You owe it to the project that wants to be born next to get this one finished, so that you can do the next one. You just have to keep the assembly line going. I know I make it sound like it’s always been a ball, but it hasn’t always been a pleasure. Sometimes it’s been painful. But it’s mostly been a pleasure. In the world of magazines, of course, none of us is immune to slickness or oversimplification—New York included. But two things make Lehrer’s glibness especially problematic, and especially representative. First, conferences and corporate speaking gigs have helped replace the ­journalist-as-translator with the journalist-as-sage; in a magazine profile, the scientist stands out, but in a TED talk, the speaker does. And second, the scientific fields that are the most exciting to today’s writers—neuroscience, evolutionary biology, behavioral economics—are fashionable despite, or perhaps because of, their newness, which makes breakthrough findings both thrilling and unreliable. In these fields, in which shiny new insights so rarely pan out, every popularizer must be, almost by definition, a huckster. When science doesn’t give us the answers we want, we find someone who will. The contrast between Elizabeth Gilbert’s slogging apprenticeship as a writer and Lehrer’s as a science journalist is striking. He’d studied to be a scientist, apparently, or at least majored in neuroscience at Columbia, and then won a Rhodes Scholarship and wrote a book. At some point, he saw he could translate science to a big audience. Just as Malcolm Gladwell raids social science, he could plunder the harder stuff. I say almost because it will never end. Obviously. But Algis Valiunas’s “King of Pain,” for the website of the Claremont Institute, while another baby-whale retrospective on the late writer, is impressive and interesting; it addresses what kind of person he was, his long but productive apprenticeship, his moral vision, his mature writing and especially Infinite Jest, and the depression that killed him. For anyone with any interest in Wallace as a fiction writer, essayist, and journalist, it’s well worth reading. Thanks for this round-up, Richard! I like what Russo says about crafting memoir. I read a review of his book last week, I think, and it looks intriguing. I like memoirs that explore relationships between parents/children. Good for Elizabeth Gilbert for focusing on the positive comments. All authors need to keep that in mind because there will always be people who don’t like the writing. You’re really on a high today, Richard! And it’s a good high (no drug pun intended). I really enjoyed the comments about memoirs and the differences between and among the writers and all the things you’ve grouped together here. A nice thread of continuity about writing weaves its way through from beginning to end; such quotes always remind me why I want to write, even though I may never do it so well or be as eloquent about it as the folks you mention. And shame on Jonas Lehrer! thanks for the tour — a good trip.